SINGAPORE (Oct. 6, 2018) – Three days into the Asia-Pacific Amateur, two past champions are among the players jockeying for position on a crowded leaderboard. On Saturday, defending champion Yuxin Lin used an 8-under 62 – the best round yet at Sentosa Golf Club – to move into the solo lead. Lin is now 10 under. Lin’s round, completed before weather moved into the area and forced a two-hour delay of play, is a new course record and the best number in the 10-year history of this tournament. He was six shots off the pace starting the day but quickly chewed through that deficit with seven birdies in his first 10 holes. Lin, of China, will turn 18 next week. “I have been striking the ball really well all week. I was just waiting for the putts to drop. I did some work yesterday afternoon, really found my rhythm on the greens, and there you go, eight under.” said Lin, currently ranked 115th in the world after struggling with a wrist injury much of this year. “Tomorrow, I am just trying to keep doing what I’m doing and try to stay aggressive out there, attack pins when I have to and hopefully have another great round tomorrow. Lin felt the wrist injury hindered his game at the Masters and the Open Championship earlier this year. He gained entry to both events for winning the Asia-Pacific Amateur last fall, and would earn the same exemptions if he could pull off a repeat. Only one player in the history of the championship, Japan’s Hideki Matsuyama (now a five-time PGA Tour winner), has ever defended his title. Second-round leaders Lloyd Jefferson Go and Cheng Jin, the 2015 champion, moved down the leaderboard on Saturday. Go, from the Philippines, had his first big number of the tournament – a double bogey on No. 8 – and settled for 69. He is solo second, but still in position for his best finish in six Asia-Pacific starts. Jin, a junior at USC who is representing China this week, double-bogeyed the ninth hole and had even-par 70 that moved him to a share of third. He is two off the pace. Go admitted that he thinks of the potential Masters start each time he tees it up in this event. “It’s been running in my head for six years, so it’s not going to change,” he said. He recently returned from the Asian Games, where he was 10th individually. The Philippines’ women’s team won gold, however, and Yuka Saso won the women’s individual title for her country. If Go could pull off a win in Singapore, it would extend that momentum. Indonesia’s Naraajie Ramadhan matched the course record Saturday with 63 before Lin came in behind him and broke it. It could have been even lower without a bogey on the 18th hole. Ramadhan is tied for eighth with China’s Andy Zhang. Zhang, who spent the past two years on the University of Florida roster but did not return this fall, was runner-up at this event last year. 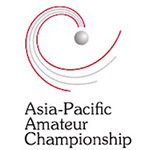 The Asian-Pacific Amateur (formerly known as the Asian Amateur) is the first of a series of worldwide championships put together by a between the Asia Pacific Golf Confederation (APGC), the Masters Tournament and The R&A. The event offers the winner an invitation to the Masters Tournament at Augusta National Golf Club. The champion and runner(s)-up earn spots in The Open Qualifying Series for The Open. The event has historically moved throughout the region and has now been held in China, Japan, Singapore, Thailand, Australia and Hong Kong, Korea, and New Zealand. A field, topping out at 120 players, is selected by the following criteria. The top two ranked amateur players from each of the APGC member countries plus the four top ranked players from the host country. If there is not a sufficient number of players ranked from that member country, the member country may nominate a player(s) from their country, to be approved by the APGC, to fulfill the two positions eligible from that country. The remainder of the field will be filled taking the next highest ranked players of APGC member countries, not otherwise qualified. The maximum number of eligible players from any APGC member country (with the exception of the host country) is six. Additional players may be offered at the event's discretion.